A week at TRL includes flights from Wabush, NL to camp and return, accommodations with full amenities in private, double-occupancy cabins, all meals including shore lunches to order, fishing licenses, guides for each day’s fishing, and two fly-outs per rod on our river system. You trip does not include travel from your home to Wabush, NL and return, hotels en route and in town, alcoholic beverages, and flight and trip insurances. Before you look through the fishing opportunities below, please note that should you decide to book a trip with us, we take your commitment as seriously as we willingly commit to you. We have roughly 80 spots available each summer. Because we have many returning guests each season, we advise you to secure your trip reservation at least a year in advance, especially if you are looking for a particular week that fits your summer schedule. Single anglers and perhaps twosomes may find space available closer to the season’s opening in June. PLEASE READ: When you reserve a spot and secure it with your deposit, that spot is taken "off the shelf", no longer available to other interested parties. It is yours. Late cancellations are very difficult for us. When an opening has been off the market throughout the booking season, then later cancelled, we suffer serious financial impact. We do not refund deposits/payments after January 1st of each booking year, though they may be transferred to a different week during the same season (if space is available) or to another party for that season only. ALSO: TRL is in the wilderness and a trip here entails all of the unexpected circumstances that wild places can bring. PLEASE FULLY CONSIDER PURCHASING TRIP INSURANCE. Unexpected challenges come to us all at inopportune times. Weather and mechanical issues are always possible in sub-Arctic areas such as ours. There is wisdom in protecting your investment against unforeseen circumstances. 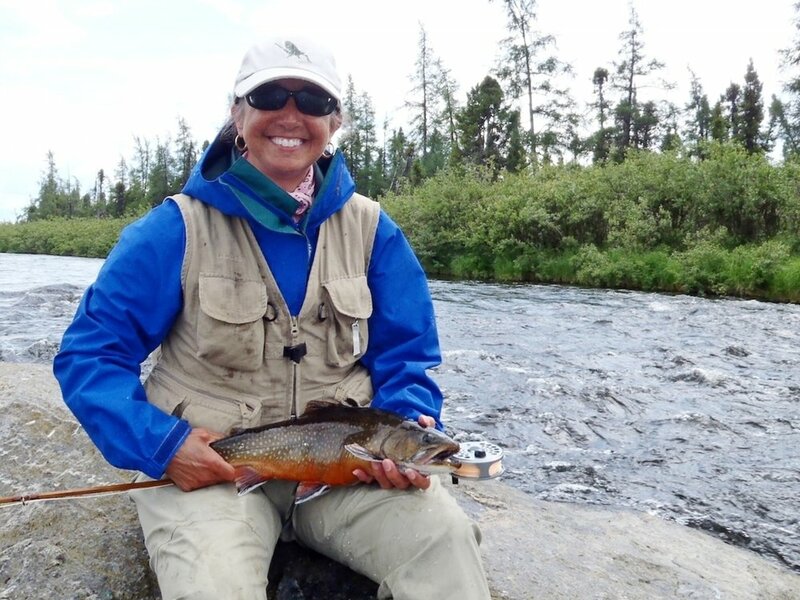 A FISHING week includes six fishing days and seven nights in our main camp fishing the feeder streams and rapids of Eagle River, Rick's Run, and Victoria River upstream and the main Woods River downstream through 12th rapids. Transfers to these locations are via 17’ Lund boats or 18’ to 23’ motorized freighter canoes. Transfers to and from our Fifth Rapids Camp and other remote locations are by floatplane when weather conditions permit. The fishing package includes two fly-outs on our river system for each angler. Accommodations in main camp are in our private guest cabins with double occupancy and a full, private bathroom for each two guests. A $2,000 USD Deposit per angler holds your space and final payments are due May 1st, 2019. (Singles who are willing to share lodging and a guide with another guest are welcome to book with us at no additional charge. There is a surcharge of $2,800 USD for single anglers who would prefer a private cabin and a private guide. (Please contact us for additional information). Our Late Season Package runs for the first week of September. This package includes float-plane transportation from Labrador City to camp and return, but no fly-outs while in camp. This is prime season for Northern Pike and Lake Trout! Like fall in New England with cooling water, late August is ideal for hunting for big Lake Trout and Northern Pike. As the temperatures drop, the big Lakers are returning to shallower waters and can be cast to along the beaches and rocky shoals. 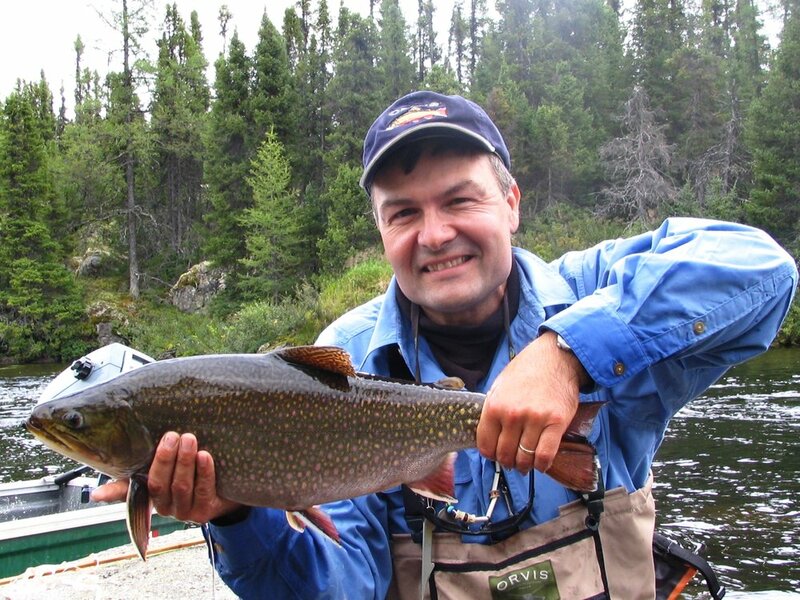 Both Lake Trout and Pike are very active at this time of year and make extraordinary game on fly tackle. Anglers are welcome to go after these monsters with either fly rods or spin-cast gear in the flat water. There is no limit to the power of these trophy fish in our cold waters. Read about our pike fishery on our fishing blog here. The brook trout have moved up into the headwaters at this time and are normally in close proximity to our main camps. They may be available to fly-fishing anglers if the water and weather conditions are such that they will not suffer significant discomfort or damage from being hooked and fought so close to their spawning time. Inquire for current availability and for corporate or group bookings. Have you booked your trip? Start planning by reviewing these documents with helpful information about daily camp activities, necessary gear, and productive flies. Also, find details about how to find your way to Labrador.